Kray Kibler, chief operating officer, chief financial officer, Scrip Companies, first joined Scrip in May 2006, gaining broad and deep experience throughout the business with responsibility for oversight of the Company’s financial, IT, human resource, customer service, distribution operations and field/corporate sales. 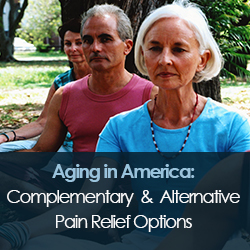 The growth in the number and proportion of older adults in the United States has created a number of issues for baby boomers, such as a rise in chronic conditions, greater demand for pain relief, overuse of pharmaceuticals and high prescription expenditures. The physician shortage further exacerbates these issues with longer waiting times and lower quality of medical care. Seniors represent 13.7 percent of the United States population, about one in seven Americans. Almost 92 percent of older adults have at least one chronic condition, and 77 percent have at least two. Disabilities, such as difficulty in hearing, vision, cognition and ambulation, are reported by 36 percent of adults aged 65 and over. Another issue is the misuse of pharmaceuticals, which will be fueled by the aging baby boomer population. Among the most common prescriptions given to older patients are opioid pain relievers and benzodiazepines, the psychoactive medications, such as Xanax and Valium, often used for anxiety. According to data from IMS Health, which tracks drug dispensing for the government, the 55 million opioid prescriptions written in 2013 for people 65 and over marked a 20 percent increase over five years — nearly double the growth rate of the senior population. One promising relief for these issues is complementary and alternative medicine (CAM), which encompasses an array of healthcare practices, products and therapies that are different from conventional medicine practices. CAM includes chiropractic, massage therapy, acupuncture, nutritional medicine, naturopathy, herbalism, Ayurveda, Reiki, laser therapy and electrotherapy. CAM also includes a large and diverse group of orally or topically administered products such as herbal medicines, botanicals and probiotics that are widely marketed and readily available, often sold as dietary supplements. CAM therapies emphasize the natural healing ability of the body and prevention versus the conventional approach of treating disease and its symptoms. A growing number of traditional healthcare professionals have begun to integrate CAM into their treatment programs for its proven benefits, including pain and injury prevention, post-surgical treatment and non-invasive pain relief. The Mayo Clinic has incorporated massage therapy into post-surgical treatment, and California now allows chiropractic services for reimbursement when they are provided in federally qualified health centers (FQHC) and rural health clinics (RHC) — further demonstrating the mainstream acceptance of chiropractic. The purpose of CAM is to move patients toward complete wellness, helping them to discover and understand the hidden causes of health challenges, creating a customized and comprehensive treatment plan, and investing in healthy aging to achieve lower disability rates down the road. It has been documented that certain populations, including seniors, bear the burden of chronic pain disproportionately. Given the high cost of pain in human lives, dollars and social consequences, CAM presents an avenue for relieving pain across the healthcare continuum. The goal of pain management is to improve a patient’s quality of life. Paradoxically, advances in medicine that have led to greater survival rates among patients with cancer, heart disease, HIV/AIDS, stroke, traumatic brain injury and many other diseases have increased the number of people living with chronic pain. Chiropractic treatment of neck and back pain, which is common among aging Americans, provides more relief than over-the-counter drugs like aspirin and ibuprofen. According to TIME Magazine (2014), in one study, after 12 weeks of treatment more than half treated reported at least 75 percent reduction in pain compared with one-third in the drug group. A year later more than 50 percent of those treated with chiropractic reported significant decrease in pain. In contrast, the patients taking pain killers had upped their dosage during the same period. Studies show that massage therapy increases endorphins and serotonin, chemicals that act as natural painkillers and mood regulators. Massage therapy also reduces levels of the stress hormone cortisol, and turns off genes associated with inflammation and its associated pain, which in turn relieves muscle soreness, according to TIME Magazine (2014). Moderate to deep pressure massage can activate the vagus nerve which regulates heartbeat, helping seniors experience pain relief for a number of conditions. Studies also show that massage helps reduce anxiety, pain and nausea in cancer patients by 44 percent, and also raises the level of cancer-fighting white blood cells, according to TIME Magazine (2014). Acupuncture has been shown to relieve a wide range of pain conditions that impact seniors, such as carpal tunnel syndrome, fibromyalgia, headache, low back pain, myofascial pain and osteoarthritis. One study found that during acupuncture trials for patients with chronic low back pain, only 15 percent of subjects who received genuine acupuncture treatment needed extra pain medication, compared with 34 percent who were receiving placebo treatments, and 59 percent receiving conventional therapy. Furthermore, long-term pain reduction was achieved more effectively in subjects who received either real or placebo acupuncture versus those who received conventional therapy. CAM’s growing popularity highlights a path for improving conventional medicine and mitigating a number of issues that aging baby boomers will face. Fortunately, U.S. medical schools are developing CAM course work, and managed care organizations are providing some coverage for CAM therapies. A study by Harvard Medical School researchers, looking at trends over the past half-century, indicates that CAM will play a role in the U.S. healthcare system for the foreseeable future – and demand for drug-free, less costly alternatives to conventional medicine will continue to grow. 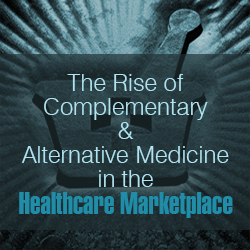 In response to the number of aging baby boomers, and the rise of chronic disease, complementary and alternative medicine (CAM) is quickly becoming a fixture in the healthcare marketplace. In combination with conventional medicine, CAM provides healthcare options that are more personal, non-invasive and less costly. CAM covers a number of healthcare practices, products and therapies, including massage therapy, chiropractic and acupuncture, to name a few. These therapies focus on fostering the body’s natural ability to heal itself, rather than the emphasis on prescription medication and technology of conventional medicine. CAM is about prevention and treating the individual as a whole. Given its growing popularity across all generations, more traditional healthcare professionals are integrating CAM as a way to prevent injury and provide non-invasive pain relief. The Mayo Clinic, for example, uses massage therapy in its post-surgical treatment. Chiropractic focuses on disorders of the musculoskeletal system and the nervous system, and is used to treat neuromusculoskeletal complaints, including back pain, neck pain, pain in the joints of the arms or legs, and headaches. Chiropractors practice a drug-free, hands-on approach to healthcare that includes patient examination, diagnosis and treatment, recommendation of rehabilitative exercises, and nutritional and lifestyle counseling. Like other forms of CAM, chiropractic focuses on maintaining an individual’s health naturally to help boost resistance to disease, rather than simply treating the symptoms of disease. Acupuncture dates back at least 2,500 years in China, and is based on the idea that there are patterns of energy flow in the body. It is believed that disruption of these patterns leads to disease. Acupuncture is intended to correct imbalances of flow at points close to the skin, and has been studied for a wide range of pain conditions, such as post-operative dental pain, carpal tunnel syndrome, headache, fibromyalgia, back pain, myofascial pain and osteoarthritis. Studies conducted in Germany on patients with chronic low back pain found that only 15 percent of subjects who received acupuncture treatment needed extra pain medication, compared with 34 percent who were receiving placebo treatments, and 59 percent receiving conventional therapy. Long-term pain reduction was also best for subjects who received either real or placebo acupuncture versus those who received conventional therapy. The leading cause of disability, low back pain affects more than 632 million people worldwide. One-third of all Americans live with chronic pain, affecting more than the number of people affected by heart disease, diabetes and cancer combined. The economic costs of medical care and lost productivity of low back pain is at least $550 billion annually.